And then for something slightly different: More of the same! You guessed it: Yesterday morning, I was surprised to find we were a bit snowed in. When I say snowed in, I mean that I have to use force to open up the front door. I think, Debert weather station reported 26 cms and it really looks like that much. This makes for slightly nice pictures, if it wasn’t so cold outside. The bad news is that it is supposed to be snowing overnight (and in the morning) again. The good news is that the snow will change to freezing rain and eventually to rain tomorrow night. With that out of the way: Via Kottke, I found this map of New York, er, an imaginative map of whatever was New York if it was still in the hands of the Dutch powers. I don’t think I have to remind the reader that New York used to be in the hands of the Dutch and that (after many wars and battles with the British empire) they traded it for portions of South America. What you say? You really like the fictional flag for this ‘Dutch republic’ (taken from the original creator’s blogpost)? 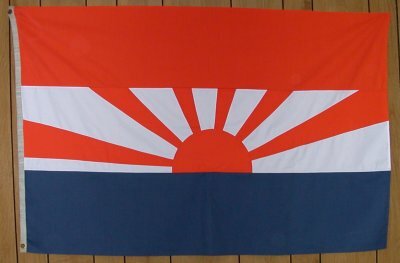 Is that the Japanese ‘Rising Sun’ in the flag? Oh dear. And last but not least: Newsweek reports that Amsterdam is to close down its Red Light district. The most surprising part is that the main driving force behind the campaign (to close down the district) is a member of the Labour Party. Socialists closing down the Public Sector in Amsterdam? What will the British think of this? This entry was posted in Truro NS, We-reflect-news and tagged Amsterdam, news, The Netherlands, Truro, Winter, winterstorm on February 12, 2008 by Arthur. Earlier today, the WordPress developers released a fix for a security issue in the xml-rpc code. There’s no need to completely upgrade your installation: upgrading overhere is sort of painless and that’s not because of the fact that my host provides automatic upgrades. Bored as I ever am, I finished up a couple of update shell scripts, which, if I have time, I could poke online one of these days. This is actually so basic, that, well, maybe you just should stick to your command-line typing skills. If your host allows you to use wget via SSH, consider yourself extremely lucky. Other stuff: over here, milk is getting a couple of cents more expensive a liter (70 cents 5 cents1 I believe, which is more than a couple). I’m not sure why I mention it here but maybe this is related to my hunt for moo-cows (I mean, my Internet hunt for the origins of the word moo-cow). I think I’ve mentioned ‘super cow powers’ before, haven’t I? Normal cells should not be affected by the virus-killing lasers or sound waves because they have resonant frequencies much lower than those of viruses. Moreover, it is unlikely that viruses will develop resistance to mechanical shaking, as they do to drugs. And last but not least is this Horizon episode (BBC/Video at Google): What on Earth is wrong with gravity? The documentary goes into details about the missing links between Newton’s (mechanical) laws and Einstein’s General Theory of Relativity. 1 I’m a bit confused here too: but I think the correct amount was actually 5 cents. This entry was posted in Hyperlinks and tagged astronomy, Debian, gravity, HIV, Linux, news, Truro, Wordpress on February 6, 2008 by Arthur. I think it’s an understatement if I’d say that last week, we’ve gone through quite some weather. Monday, we started out with lots of rain which at the end made our driveway look like the perfect ‘slide and glide ramp’ for the Nova Scotian Winter Olympics of 2032. The situation in Nova Scotia wasn’t as nearly as bad as in PEI, of course: overthere, the storm turned into a freezing rain storm, eventually knocking out power in many regions on the island. Then, Friday (and Saturday), Weather Canada called for another storm: Friday, the winterstorm hit Ontario and Quebec (which you can read about it on the Internationalist). Yesterday, that storm hit our region and, yes again, it brought too much wind and too much rain, which (in turn) made our driveway look like the perfect place for hosting the 2056 Nova Scotian Driveway Marathon. This entry was posted in Truro NS, We-reflect-news and tagged Nova Scotia, PEI, Truro, Winter on February 3, 2008 by Arthur. A couple of days ago, the local news paper had an article about a lady from Wales who’s walking around the world. Rosie Swale Pope started her run in 2003 and is scheduled to finish her travels this year. She passed by Truro, I think and is on her way to Halifax now. The Daily News also has a short video clip, which shows her walking through one of our famous (Canadian) Winter storms (I bet that the clip won’t be archived and will go in the Halls of 404 in a couple of years, so I’d say hurry and watch it, before it disappears). Looking at the footage, I keep thinking how dangerous it is to actually walk on the road with that big of a cart behind you. That said: good for her for doing this on her own. Stay safe and stay clear from the snowplows, ma’am. This entry was posted in Provincial-Scotia, Truro NS and tagged Nova Scotia, Truro, Winter on January 18, 2008 by Arthur. Maybe it’s too early to call it a day (Weather Canada issued snowfall warnings for the next 24 hours), but, I was just outside and noticed that the sky is almost cloudless. Or maybe this is the typical ‘calm before the storm’. We had quite the share of snow a couple of days ago and then some more this morning (and early noon), which didn’t stop us from venturing out to the mall, and way before that, the traditional shoveling. I was smart enough to shovel most of the snow last night. Talking about that mall (the Truro Mall, that is, and yes, they’re online too): I noticed that two major stores are relocating to elsewhere in town, making the mall a perfect location for the zombie movie series ‘Dawn of the Dead: Alive in Hubtown (part IX)’. Soon in a theatre near you, I hope. Update (01/01/08): No extra snow for this region. Apparently plenty of snow in Cape Breton. This entry was posted in Truro NS and tagged snowstorm, Truro, zombies on December 31, 2007 by Arthur. It looks like we’re in the midst of the winterstorm that earlier pested Ontario, Quebec and New Brunswick. The (local) forecast tells that we can expect a mix of heavy snowfall (15 cms and up) and (possibly) rain during the Monday morning hours. It is a kind of silly to see rain being mentioned: the last couple of weeks, the temperature has been hanging around the -5 to -10 degrees zone. I saw that Marian (at the Internationalist) uploaded a couple of short movies to Google (one, two and three), which show what a snowstorm looks like over here (I’m looking at you, Europeans). This reminds me that at one time, Alfons came over around Winter time just to see what such a snowstorm looked like. If I’m not wrong, he missed it by a week. For now, I haven’t decided to wait it out or start clearing out the driveway: At this stage, the snow (and pellets) are light enough to brush aside with a smaller shovel. It won’t be when it starts raining. This entry was posted in Truro NS and tagged Nova Scotia, Truro, winter storm on December 16, 2007 by Arthur. From what I’ve heard, sections of Northern Truro (including Onslow) are still without power and according to NSP, power for most customers won’t be completely restored until Tuesday. I have a tremendous amount of respect for the crews on the road, but I find it a bit hard to believe that it has to take that long, particularly since weather has been pretty good the last couple of hours. The worst part is that it’s getting colder, again. So much for the tropical and moist winds. Having experienced being without power for six days: for the ones that have none, stay warm and find relatives who do have power and are willing to give a lending hand. I was asked to compare Noel to that (inevitable) Juan storm: obviously (as a light sleeper) I heard the wind last night. At times, I could feel the house swing and hear the studs croak and make noises. Obviously, I was surprised to wake up and find out we still had power this morning. During Juan’s tenure I slept a whole lot better, I think: What woke me up in 2003 was the sound of roaring chainsaws. This entry was posted in Truro NS and tagged hurricane, noel, Nova Scotia, Truro on November 4, 2007 by Arthur. We seem to have lost shingles and a tree (one of its main branches seem to have broken off) but we haven’t lost power. Nova Scotia Power reports plenty of areas with no power, including Truro. I guess we’re lucky, for now (I’m assuming that we may lose power in case power needs to be restored to other areas, since we’re apparently on the main grid). A couple of news articles for your interest: The CBC reports that as many as 170,000 homes and businesses have lost power and suggest that for some of them, power may be restored in a couple of days. CanWest notes that the strongest winds were reported in Cape Breton, where winds speed hit as high as 140km/h. Oh, and while CNN and BBC are currently lacking news reports, it seems that the news of Noel hasn’t gone unnoticed in Europe (via Alfons, Dutch only). Update 1: Updated article at CBC’s re: power issues. According to the news, NSP crews are allowed to use their own judgement to repair lines as long as wind gust don’t go over a specific speed (sustained): I see that some of the earlier mentioned areas all have their power restored while new areas with outages seem to pop up every hour. Locally, the same pattern as usual: wind at times gusting, pockets of rain (“patterns” as one of the TV forecasters calls them) with casual power flickering. One good thing about it though: As I mentioned before, it was rather chilly this morning: Noel brings (at least) some warm temperatures, albeit for only a couple of hours. This reminds me: Officially, Atlantic Daytime Savings ends tonight1, meaning that we’ll have an extra hour sleep. If you think of it, in Atlantic Standard Time, the storm is going to take ‘one hour longer’ to move out of the Maritimes: if meteorologists had never started to use UTC (Coordinated Universal Time), you could say that hurricanes can travel through time. 1 Clocks falling back means more pedestrians killed. I just watched the special news bulletin and it looks New Brunswick is going to get the brunt of the rain and wind (image via StormAdvisory, via Ruk). It’s going to take a while too, for Noel to make its way through the Maritimes: earlier forecasts suggested sunny and dry weather for Sunday morning. If I’m not wrong, the forecast now warns (besides of heavy winds) for a whole lot of rain, between the 50 mm to 60 mm for our area. At CTV, there was the (inevitable) comparison between Juan and Noel: A manager at the Hurricane center in Dartmouth said that Juan was a lot more compact and (for the remainder of its track) did not expand as much as Noel has been doing the last hours (compare here). Apparently, this surprised weather forecasters and watchers in the US, who are now reporting that New England is being battered. 1 NS Power’s ‘Outage information’ page (which won’t be much help if you’re out of power). 2 At 8:57PM: Wind is gusting and storming. Outages reported around Bridgewater, Chester, Dartmouth, Kingston and Middle/Upper Musquodoboit, with reported estimated time to restore ’11/06/2007 11:30PM’. I think somebody at NSP made a typo there. Obviously crews will be waiting for the storm to cease down.